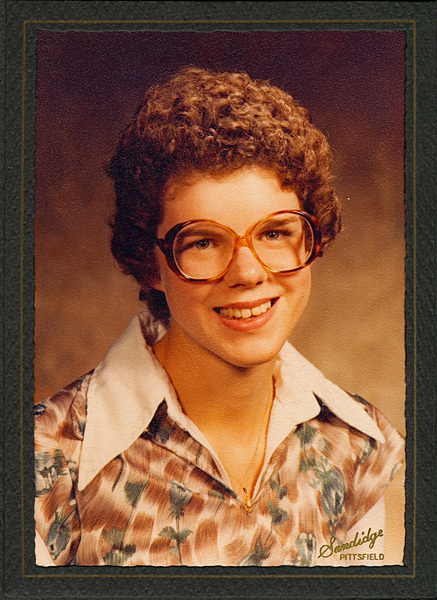 This is my seventeenth post, for age 17, of the October Memoir and Backstory Challenge hosted by Jane Anne McLachlan. My previous posts: Baby Speed Eater, Two Tales, Curls, Most Magical Christmas, Kindergarten, Places, Mental Health in 1969, The Boxcar Children, The Little House Books, Too Thin, Four Square, Curls: Take Two, Scouting, Schools, Sophomore Year, and 1979 Book Review. Awkward scheduling in my senior year of high school left me with a 1st period study hall that I didn’t need for study, so I volunteered at the library. Magazine management was my primary duty since the mail came at the end of the previous day. My job was to put the magazines alphabetically on the display shelves at the entrance to the library. Of course, that didn’t take a full fifty minutes so I also had plenty of time to read the magazines. 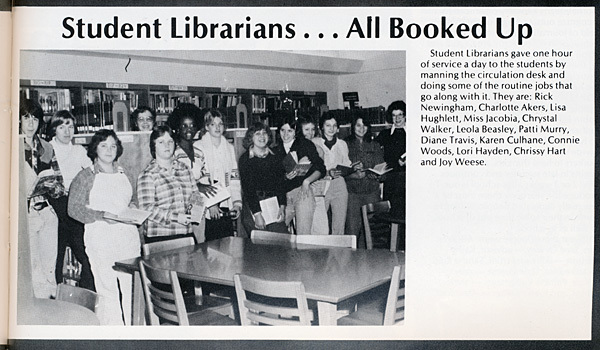 Student Librarians in the 1980 Alamo, the yearbook for Louisiana High School. I’m on the far right. The best days of the month were when Writer’s Digest and The Writer arrived. I poured through those issues and dreamed of one day being an author. I also liked the weekly news magazines. It was a tense time with hostages in Iran, an Olympic boycott, and a bail-out for Chrysler. Knowing that I would soon be leaving my small town, I took greater interest in world events. It would be more than twenty years before I took that early experience to library school and another ten or so before I took the dream of being an author seriously. If I could write a letter to myself on the day I graduated from high school, I think I’d say to get to work on both of those career goals more quickly! Except, that I kind of like the way my life played out — maybe the side trips through physical therapy, computer science, and niche magazine publishing were necessary. What would you tell yourself as a high school senior from what you know now? Oooh, so many things I wish I had fully understood at that time…but then I think the detours were learning those lessons. I see that so often in myself and others that we are just about to step on the express path to our true calling but pull back and take the long more difficult route. Good question Joy. I’ve thought about the “what would you change” scenario and can’t think of a thing because without going thru what I went thru I wouldn’t have what I have and be me right now. The big, BIG mistakes have resulted in the most treasured things in my life…like my children…so couldn’t go back for better advice or different directions at all. I’ve often thought about what I would change. I wish I’d kept writing after I married, really seriously writing – but I know why I didn’t. I wish I’d waited longer, lived on my own and supported myself before marrying – but then I’d have married someone else, and though I can imagine myself just as happy with another husband, I can’t imagine myself with any other children. Yes, like you. I like the way my life has played out. I was a librarian assistant in High School too. What would I say? Cultivate your instinct and stand your ground, sooner the better. Even if that might cause a butterfly chaos effect? I dunno.